As a scientist searching to discover plant species and investigating how they interact with other living things, I am not only looking for answers to my research questions, I am searching to understand how we can ensure the longevity of species that are vanishing from the wilderness. Biodiversity research may seem romantic and stir up mental images of a small band of scientists enjoying muddy and rugged adventures in the wilder parts of the earth. However, there are few other fields where scientists are as impelled to spend time in urban areas with the public, communicating their research and its significance. I can hardly imagine a better research subject than the Tacca flower (pictured above) as an example of how fascinating plants can be and how unknown they still are to us. 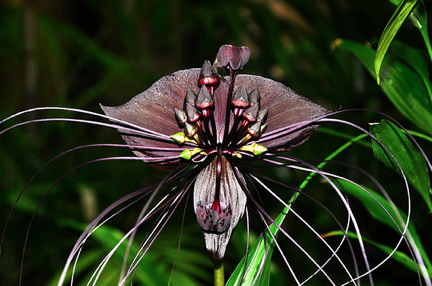 Species of Tacca have a range of common names such as bat flower, devil flower, magpie lily, fortune cat, tiger’s whiskers, all of which encapsulate people’s excitement and curiosity at seeing these plants for the first time. Their horticultural popularity is down to the feel of the exotic Asian tropics they give to enthusiasts. The dramatic reproductive display seems to have come straight from the haunted Gothic fantasies of H. R. Giger, with modified leaves shaped and colored like the ears and whiskers of a bat placed upon a face-like cluster of bell-shaped flowers. The pollination of Tacca is, contrary to one of its common names, not performed by bats, magpies or cats (big or small). The historical diagnosis is conflicted, but there is some evidence that shows that they are pollinated by midges. The plants seem to be deceptively mimicking the flies’ natural prey, by producing heat and the scent of insects that these midges feed from. Much has been made recently about the exploding quantity of data that scientists have to deal with, but at least for the field of observational research, the process remains largely unchanged from the 17th century. There may be more sophisticated tools to tell you where you are, and to keep the water from turning notebooks, gear and specimens into moldy ruin, but the benefits of having boots-on-the-ground are far from extinction. There is still no shortcut for field observation and collection. I am only beginning to discover the unique life history and morphological adaptations that these plants possess in order to perpetuate themselves. All of this has been accomplished by physically being in the forest at dawn observing the plants, battling leeches, monkeys and wild boar. A crab-eating macaque (Macaca fascicularis) waiting for the author to leave so he can eat her plants (Bukit Timah Nature Reserve, Singapore 2012). 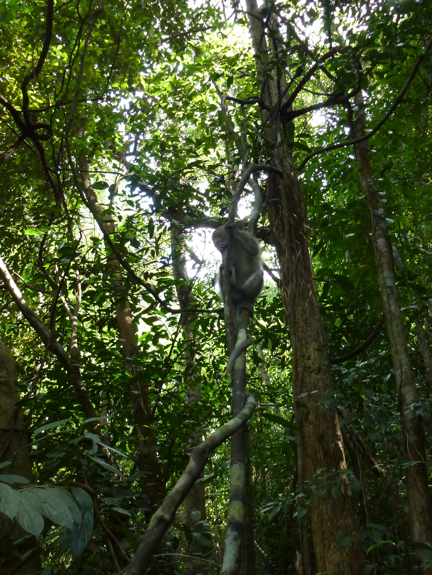 The need for boots-on-the-ground is one of the problems that curtails the pace of biodiversity research in general, and, in particular, impedes the discovery of new species in Southeast Asia. The slow progress of biodiversity research is not just academic – the less we know about the life history of even charismatic plants like Tacca, the harder it is to generate interest and awareness. People like stories, and the interaction of every species is a series of stories about how an organism has evolved over time to survive or even flourish with/at the expense of its neighbors. The problem with keeping biodiversity research academic is that the more species that are reduced to names on lists, the less interest there is in protecting each one or understanding how they came about. Take the example of Cordyceps – about which most people would know nothing about other than its latin name (hint: it is a genus of fungi). Now I challenge you to watch this video and not feel like the world would be a lesser place were these species to cease to exist. There are no quick and easy answers to change the status quo – outside of agitating for and presenting biodiversity to people broadly and continuously. The extinction of hundreds of thousands of species because of human activity is an abstract concept we learn from articles, presentations, exhibitions and speakers. The arguments seem to be upside-down. We’re not trying to understand and preserve biodiversity for their sakes, but for ours! Too often we forget that our survival depends on seemingly exotic species, because they are part of a global ecosystem that feeds us, provides breathable air and tolerable climates to us. We know the life on earth can survive catastrophic extinction events, but it’s less clear whether human life will survive in similar scenarios. Gwynne Lim is a 2010 fellow of the Fulbright Science and Technology Award Program, from Singapore, and a PhD candidate in the Department of Plant Biology at Cornell University.